In recent weeks, people have been out and about training for sponsored events. 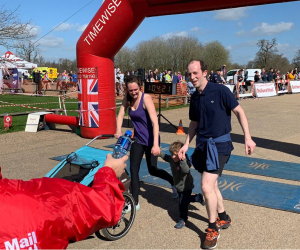 David, Sarah, Oliver (3) and Joshua (11months) successfully completed the Blenheim 5 mile run. It is true that some of the party needed to take time out in the running buggy. A group from Haseltine Lake and other supporters have entered the Bristol 10km and Chloe is training very hard for the Iron Man Triathlon in Bolton on July 14th. Good luck to you all!